Are you attending Premiere Orlando? I'm getting pretty excited; it's always a nail friendly show and so much fun to work! 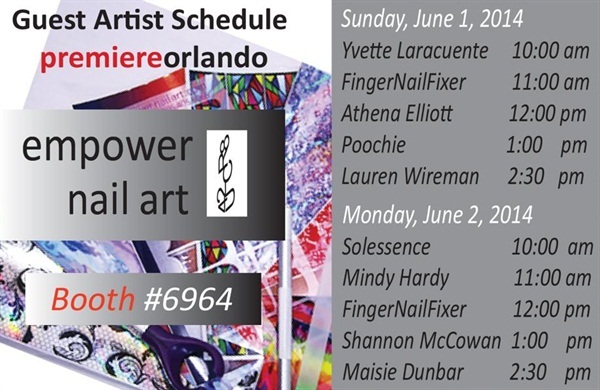 I would love to see as many of you as possible, so be sure to swing by the Empower Nail Art booth to say hi. I will be demoing set hours and working in the booth outside those hours, which should make me easier to find than I was in Chicago, lol. I will be giving away more of the Flowery File packs in Orlando, so keep an eye on the blog the week before the show to see how to win. I'm thinking of a scavenger hunt of some sort! If you can't make it to Orlando, I have a couple other summer opportunities for you to catch me in classes open to all nail professionals. One is in Gatlinburg at the Nail Tech Event of the Smokies with Kim Jones. We are teaching the Master Sculptor class and would be thrilled to have you in class. You can sign up here! Registration ends June 9, so don't wait too long to sign up. Registration ends at the beginning of July and we fully expect these classes to sell out since there are only 20 spots. You may want to be sure and register before mid June! Never fear my global friends...the U.K. and Australia are in my sights this summer as well. Keep an eye out for more details with dates and locations.